I’m a writer, and I understand the pleading of bone marrow at the physical level. And I worked to reduce that pleading during 42 days of chemotherapy spread over two years. Some cancer patients live on maintenance chemotherapy, which involves receiving bone marrow stimulants like Neupogen or Neulasta after each infusion to keep white blood cell counts up. One patient who had Neulasta for dozens of cycles was told she had widespread bone metastases. Upon further investigation, those studying her situation agreed that what appeared to be metastasis in the bones was actually not cancer, but the long-term effects of the marrow stimulant. The shots cause bone pain and are extremely expensive. When long-term use of these shots causes serious damage, why not try adding some safe integrative therapies that strengthen the body to avoid the shots? I was offered the shots after each cycle, yet I turned them down because I wanted to try natural means for keeping my white cell counts up. It’s necessary to have white blood cells to prevent infection. If levels drop too low then chemotherapy is postponed, which can create its own set of problems. I did not want the bone pain and the enormous additional stress it would add to my body on top of the chemo. Rather, I wanted to strengthen and support my body. I used diet (lots of carrots, cooked mushrooms, and bone broth), acupressure, visualization, and Emotional Freedom Technique. I ended up needing only one shot one time to raise my white cell counts. No one has studied whether what I did could work or not, and no one will because there’s no money to be had. Alternatively, no one will ever try to prove they don’t work, again because there is no money to be gained. I don’t think any of the things I did worked on its own. I think it was a healthy dose of each process done faithfully that made it possible for my body to produce enough white blood cells to get me through two years of aggressive chemotherapy with only one shot. Did my processes work to keep my white cell counts up? It appears, based on the fact patients are routinely given the shots because they are not expected to keep their white cell counts up, that it probably did. I don’t know anyone else who has been able to avoid those shots (I’d love to hear from anyone who has!). As always, discuss with your oncologist before passing up the shots. My blood counts were closely monitored. It took a big commitment on my part to work at these processes every day. For me, it was worth it. What is your life worth? What is your health worth? Are you willing to try safe integrative therapies to give your body every single fighting chance you can? There are so many things that can be done that have not been scientifically proven, but if they are safe and you discuss them with your doctor, they just might give your body the edge it needs. Sometimes it takes it all to turn the corner. It did for me. And that doesn’t mean it will happen for everyone, because we are all different. But I was not going to sit back and let the doctors and only scientific studies determine what I would and would not do. If I had done that, I know I would have died at least six years ago. I chose to do everything medical and everything safe that I could. And it worked for me. Maybe it will work for others. That is my hope, because often with this disease, we are without real hope. I want the suffering to stop. I want the pleading of bone marrow to stop. And so I share what I did. Vince Lasorso at Whatever Works Wellness Center in Cincinnati created the “Bone Marrow Healing” CD I used during treatment, and occasionally now when I feel a cold coming on. The visualization involves feeling—not seeing—one’s bones lighting up. I highly recommend it. More information on what I did to support my body during chemotherapy can be found in Thriver Soup. He restores my soul. He leads me in the path of righteousness for his name’s sake. Even though I walk in the valley of the shadow of death, I will fear no evil; for you are with me, your rod and your staff, they comfort me. When did you first come to know that you had Cancer? How did your Cancer end up getting detected? What was your initial reaction when you received your diagnoses? How to go about reducing the impact of chemotherapy? Alternative Practice – Holistic healing. Action Step – Going out, doing everything I can to be healthy. I was not going silently into that dark night so I picked myself back up. I worked with that fear and sorrow and that absolute powerlessness. I continued all my healing processes. Major Life Lesson – There is a genuine hope, and there are always options. Life Purpose – To share my message about healing our attitudes, behaviors and being able to make major life choices that we need to. Best Advice – Get to a therapist. Manage my emotions in a healthy way. Personal Habit – It’s the map of emotions, and that’s the practice of experiencing the sensations in my body without thinking about them until they leave. Chemotherapy clinical trials for leiomyosarcoma (LMS) were discussed briefly Oct. 8 at the National Leiomyosarcoma Foundation patient symposium in St. Louis, Mo. This was one of several cancer treatment topics that I am reporting about during the coming weeks. There are 70 different types of sarcoma, and treatment is moving toward individual types of sarcoma using genetically specific molecular therapy, said Dr. Scott Okuno, Chief Medical Officer in Sarcoma Alliance for Research Through Collaboration, a non-profit research cooperative, and professor of oncology at Mayo Clinic. “As we get deeper into LMS, we find molecular subtypes of LMS,” he said. He explained that adjuvant treatment is preventative. Typically a tumor is removed and the patient is given additional treatment to eradicate microscopic metastatic cells. Neoadjuvant treatment is given prior to removal/ablation of a tumor, and is used to shrink the tumor and eradicate any microscopic metastatic cells. In determining which path to follow, the physician will look at outcomes. For neoadjuvant treatment, for example, perhaps 33 percent (about three of 10 patients) will have a recurrence. With adjuvant treatment, there might be another 33 percent reduction in recurrence—which means instead of three out of 10 patients with recurrence, there will be two out of ten patients with recurrence. Chemotherapy is given when a tumor cannot be surgically removed. In clinical trials, a tumor has to decrease in size by 30 percent to be considered a partial response. Progression has to be a greater than a 20 percent increase for the treatment to be considered no longer working. Sometimes the lump might get bigger but the tumor is dying, so the percent increase in size is allowed. One needs a sarcoma specialist to determine if the growth is from dying cells or from a growing tumor. Dr. Okuno said Gemzar and Taxotere together aren’t showing much difference beyond just what Gemzar can do. Dacarbazine alone doesn’t make much difference. Yet when Gemzar and dacarbazine are combined, patients tend to have better outcomes. A difference in outcomes also was found in the rate of infusion—for example, infusing the same amount of chemotherapy over a longer period of time can result in better outcomes. Medieval literature contains references to the horn of the unicorn being full of healing energy, according to William Jackson in The Use of Unicorn Horn in Medicine. “It was even said that poisoned wounds could be cured merely by holding a piece of the horn close to them,” he writes. Some European royalty claimed to have unicorn horns, and some ceremonial chalices were made from these rare and exotic treasures because they were believed to neutralize poison. These objects most likely were made from the long, single tusks from narwhals, which are medium-sized Arctic whales. 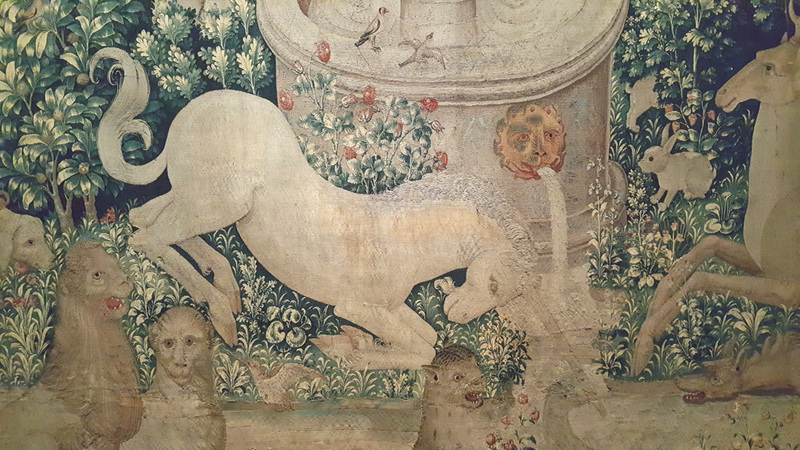 A tapestry at The Met Cloisters in New York City depicts a unicorn dipping its magical white horn into a poisoned stream to purify the water so onlooking animals could safely drink. Perhaps a little unicorn unction could be useful for dealing with the side effects of poisonous chemotherapy. During 2014, a five-year-old said she wanted to ride a unicorn when she finished chemotherapy. Lily Raffray’s wish was granted—a party was thrown for her, complete with a ride on a beautiful white horse sporting a unicorn horn. That seems like some pretty sweet medicine to me. For fun, add a little unicorn magic to your chemotherapy experience. Place a unicorn on a home altar, wear a unicorn pendant, or cut out a picture of a unicorn and tape it to the chemotherapy infusion bags or your water bottle. Then ask for the blessing of healing unicorn-like unction in your experience to reduce the side effects of the poisons.